For 2018, Audi's A3 compact-luxury sports car is offered as a sedan, convertible and, in the A3 Sportback e-tron, a plug-in hybrid hatchback. 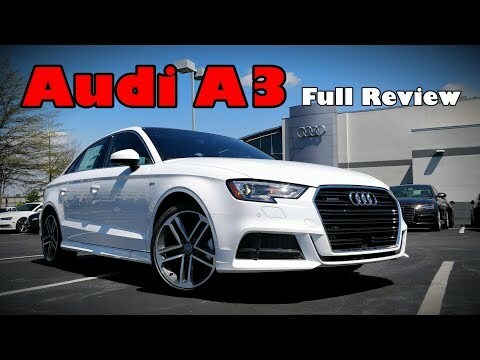 Although small, the A3 contains all the requisite Audi parts, including a powerful engine lineup, a quality interior, loads of high-tech goodies and the option of quattro all-wheel drive. Overall a great car, some user issues. The e-tron has options for ev, hybrid, and gas modes. It plugs in and offers approximately 25 miles of ev mode which is plenty for my daily commute. I cannot remember the last time I got gas! I am still getting used to the keyless start with the push button, sometimes it starts easy and sometimes I have to press and hold the button. I also have some trouble with the USB plugs for my phone, at times it will not read the media player and I cannot listen to music while I drive. This is my first luxury car. The build quality is excellent, and cabin is made with high grade materials and looks and works well. It is comfortable and a nice place to be. Even the steering wheel â€” leather-wrapped and solid â€” feels like a premium product. It handles well. My only complaint is that the acceleration is a bit jerky at the low end, with a discernible lag. It is a beautiful fun car to drive. I only have the basic model so it is very limited compared to the technology of other makers such as Honda. However, even know it is less of a car compared to my older Honda, the Audi is the best car I have owned. The drive is smooth and quiet. Handling is excellent. I am completely happy with my purchase. Volkswagen Group of America, Inc. (Volkswagen) is recalling certain 2017-2018 Audi A3 Cabriolet and A3 Sedan vehicles. The Engine Control Unit (ECU) software may misinterpret the flywheel rotation on engine start-up as a "knocking" condition, and the adjusted air/fuel mixture may result in an engine stall. Audi will notify owners, and dealers will reprogram the ECU software, free of charge. The recall began September 19, 2017. Owners may contact Audi customer service at 1-800-253-2834. Volkswagen's number for this recall is 24DF. Volkswagen Group of America, Inc. (Volkswagen) is recalling certain 2018 Volkswagen e-Golf and Golf R vehicles, and Audi A3 Sedan and RS3 vehicles. The rear seat frame head restraint guide sleeves may be incorrectly welded to the seat frame. If the guide sleeves are incorrectly welded, in the event of a crash, the rear seat head restraints may have reduced stability, increasing the risk of injury. Volkswagen and Audi will notify their owners, and dealers will inspect the guide sleeves for incorrect welds, replacing the rear seat frame, as necessary, free of charge. The recall is expected to begin January 11, 2019. Owners may contact Volkswagen customer service at 1-800-893-5298 or Audi customer service at 1-800-253-2834. Volkswagen's numbers for this recall are 72H8 (VW) and 72H9(Audi).